When Brussels decided to end tax avoiding practices within its member states, Britain decided to leave the EU. Why don’t we trust HMRC? 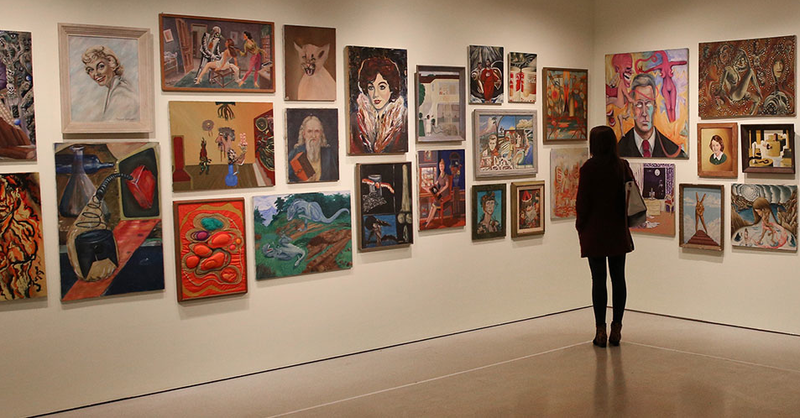 14 rooms or alcoves displaying selections from the private collections of 14 post-war artists from around the world, alongside one or two works by each artist in question, the idea being that knowing something about the artist’s tastes and favourite objects throws light on their work. 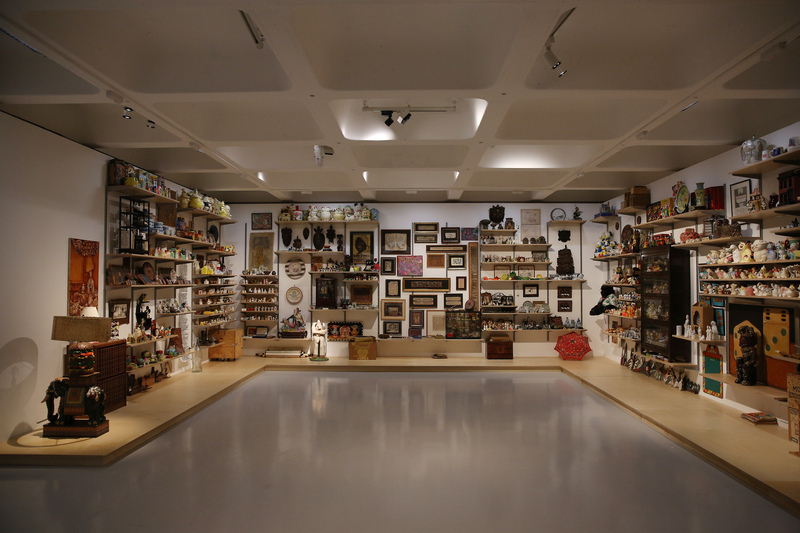 From cookie jars to netsuke, scarves to spacedogs, taxidermy to trinkets, explore the personal collections of post-war and contemporary artists and discover more about their inspirations, influences, motives and obsessions and what drives their eccentric desire to collect. 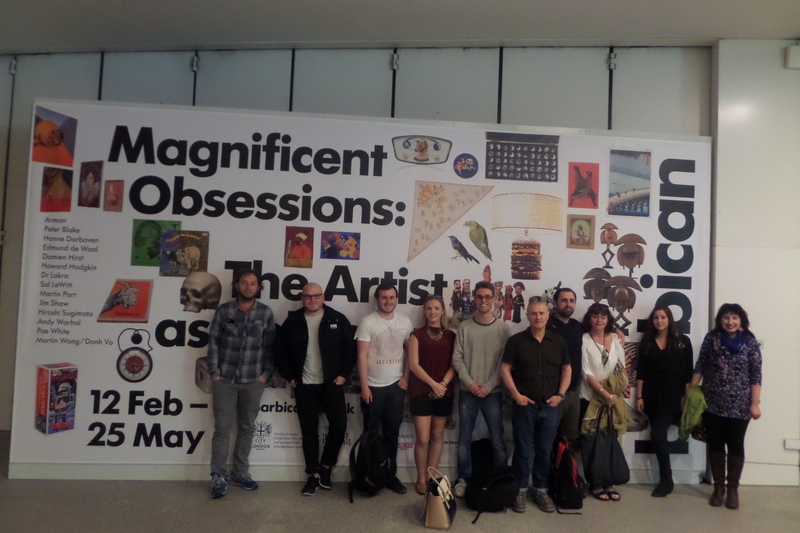 Taking a different approach to the typical art exhibition, this show primarily looks at the art collections put together by artists themselves; encompassing a broad range of styles and disciplines. 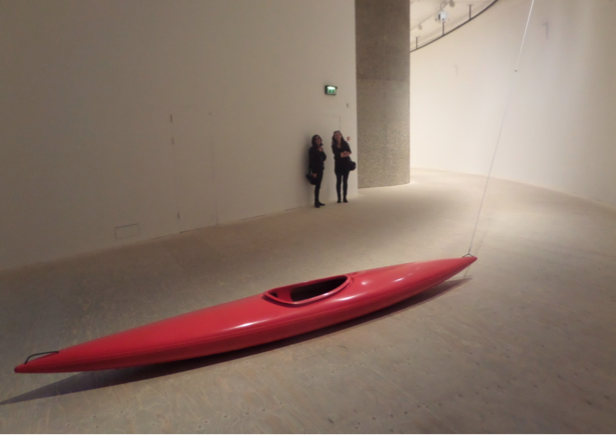 I visited the Exhibition at The Barbican yesterday. This is the first major exhibition in the UK to present the fascinating personal collections of post-war and contemporary artists. Ranging from mass-produced memorabilia and popular collectibles to one-of-a-kind curiosities, rare artefacts and specimens, these collections provide insight into the inspirations, influences, motives and obsessions of artists. While some artists are connoisseurs, others accumulate hoards of objects, never letting anything go. Many live with and make direct use of their collections and others keep them under wraps or in storage (e.g. Andy Warhol). 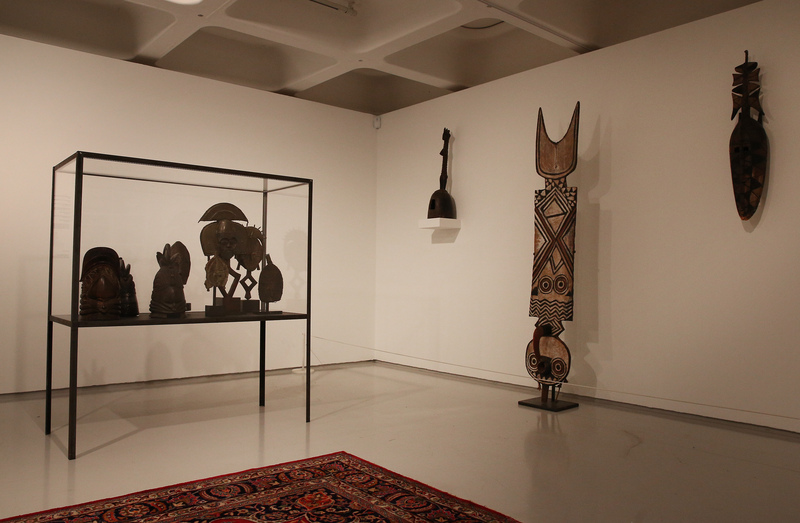 Collecting objects for research and study is key to the practice of many artists in the exhibition. 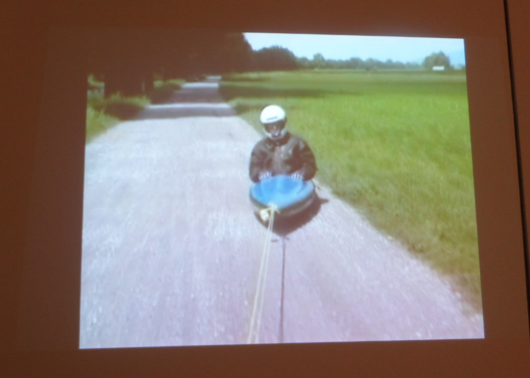 Presented alongside examples of their work, their collections, in turn, help to elucidate their art. Japanese photographer, spent decades as a dealer in Japanese artefacts and folk art, keeping many of the best pieces for himself, and eventually exhibiting the works intermingled with his own photos, the ones featured here being odd b&w photos of Madam Tussauds exhibits, The Hanging and Benjamin Franklin. Natural History dioramas. Objects from the Odawara Foundation. Jaques Gautier D’Agarty anatomical / autopsy illustration plates. The picture of Benjamin Franklin by Hiroshi Sugimoto, 1999, gelatine print is of exceptional high quality. Murderme Collection. 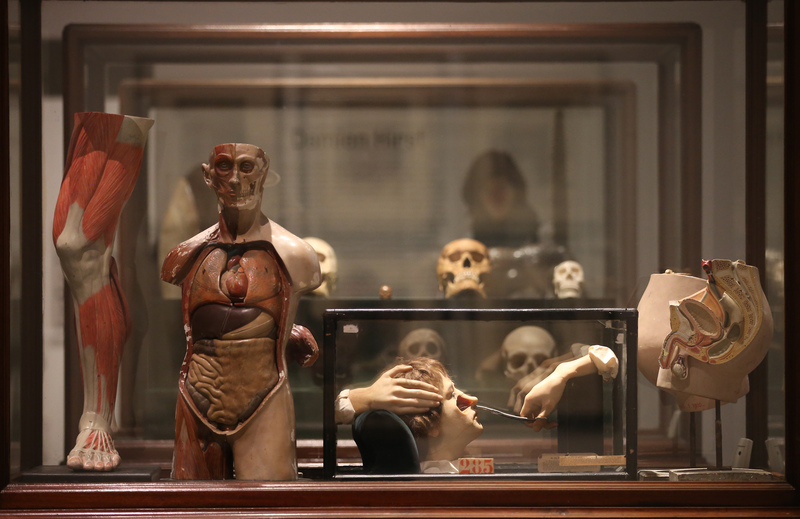 Taxidermy abject oddities and fakes; Art and natural history pieces; Chimps head supported only by its arms. Butterfly and beetle collection (Etymology series, 2013); 7 legged lamb; anatomical models and so on. Hirst’s his selected work is Last Kingdom (2012) from the Entomology series, echoing the display cabinets of Victorian animal collectors, pinning same-sized specimens of butterflies spiders etc into neat rows. Hirst is a keen collector of contemporary art but also of natural history objects, tools and specimens and we are treated to glass cases containing a stuffed lion, a stuffed vulture, stuffed armadillos and a neat array of human skulls. Minimalism and conceptual art; repetition and variation within a closed self imposed system. EDO period japanese wood block prints from 1800s… * (Hmm, did Edvard Munch base The Scream on similar Japanese wood block prints?) Sol Lewitt, Autobiography, 1980/2012 – is a collection of B/W digital prints with 60 framed sheets (displayed 20 rows 3 columns), nine images per sheet. 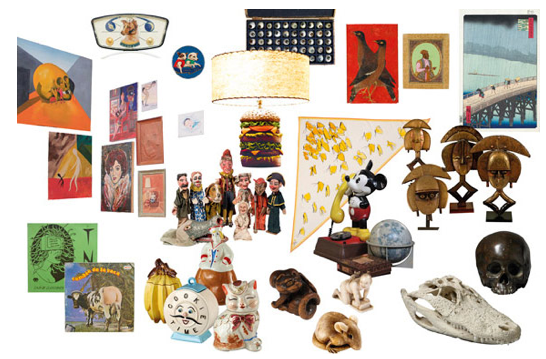 The images displayed were of household objects grouped by type in his personal collections: lamps; shades; boxes, tins; nails; timepieces; electrical items; phones; fans; seashells; photos, books, magazines; furniture, handles; toys; cups, glasses; tools, string; office equipment; windows, shutters, bars; and so on. Hanne Darboven (1941 – 2009) – Hamburg. The rigid seriality of Darboven’s work is personalised by the inclusion of her environment or, of her objects and possessions. 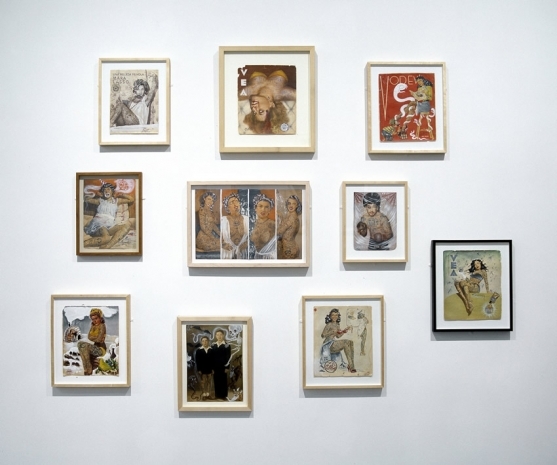 Mitarbeiter und Freunde (co-workers and friends), 1990 – Here 91 framed sheets are displayed showing photographs of subjects alongside indecipherable scribbles. Objects from her studio, Objects form her House – Hanne Darboven, is an eclectic collection that includes a life-size painted wooden horse and a life-size wooden King Cobra lamp stand. Dr Lakra, (b. 1972) Mexico, lives and works in Oaxaca, Mexico.. The artist blurs techniques, mediums and cultures, a hybrid visual vocabulary, distilled from a range of sources. 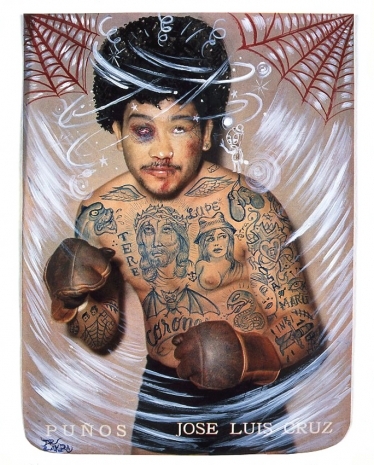 Dr Lakra – Punos (Punch), 2003. Frente al Espejo (The Mirror), 2003. – are “tattoed” images picturing semi-naked subjects that the artist has intricately drawn on using influences from traditional tattoo designs. Dr Lakra and Kate McGarry. 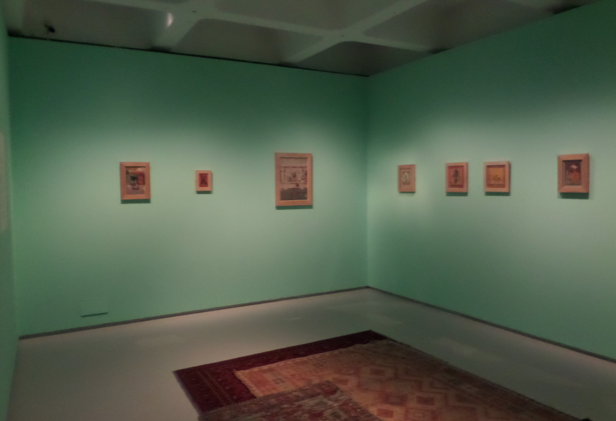 Dr. Lakra, Installation view, ‘Magnificent Obsessions’ at Barbican Centre, 2015. Courtesy Barbican Centre. 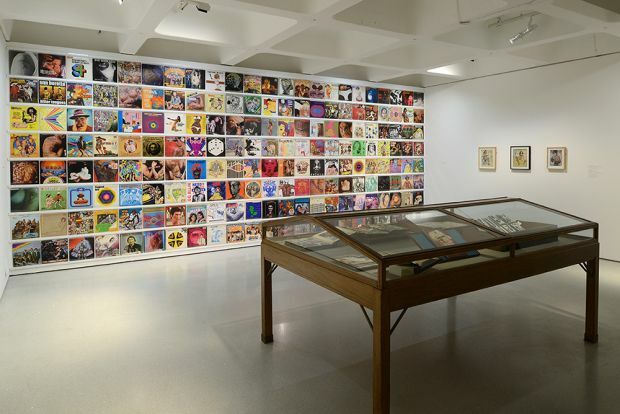 The wall display of a collection of album covers were loosely connected under the theme of Tattoos. * (I own quite a few of the ones on display!) Scrapbooks: models, anatomy, ethnography, totems, faces made from anatomy, advertising (vintage Ads). In this exhibition ‘All the unknown painters that painted the thrift store paintings are the actual painters of the paintings’ – Jim Shaw. Thrift store collection and garage sale items of American popular culture. A developed visual aesthetic, found inspiration in his formative influences and a love of comic books and sci-fi. Appeal in thrift store paintings lies in their PROFOUND UNDESIRABILITY (*an important concept to me). Cheap forgotten and available to a modest budget. 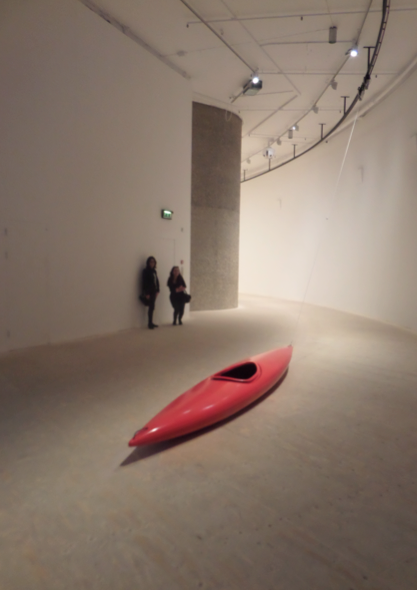 `he selected works of a surreal nature, disturbing/dreamlike – but no interpretation or validation. Shaw often works with intense cycles of narrative using motifs from his life and unconsciousness to explore and question notions of belief, identity and society. 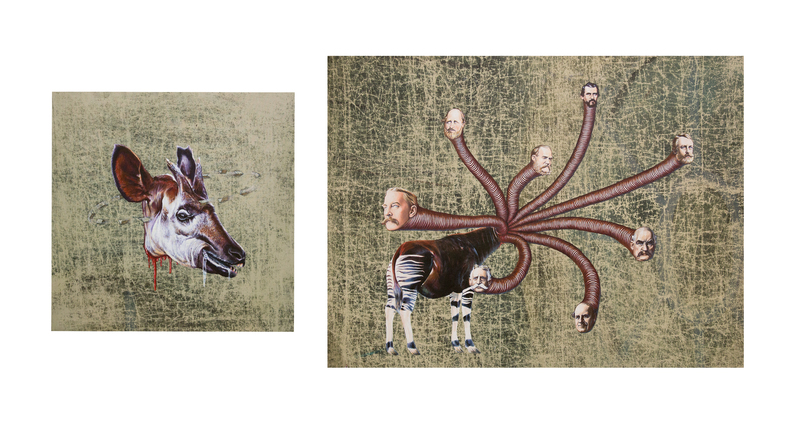 Decapitated Okapi 1 and 2, 2014, Jim Shaw, are surreal images bound up in Shaw’s fictional religion of “Oism”. The heads of “robber barons” growing alarmingly from the severed neck of a beautiful, endangered Okapi. Represents the corrupt power of the founders of American capitalism of 19th C. includings its top industrialists (Henry Ford, Rockerfeller, etc). The aged worn surface lends it gravitas and a sense of performance. 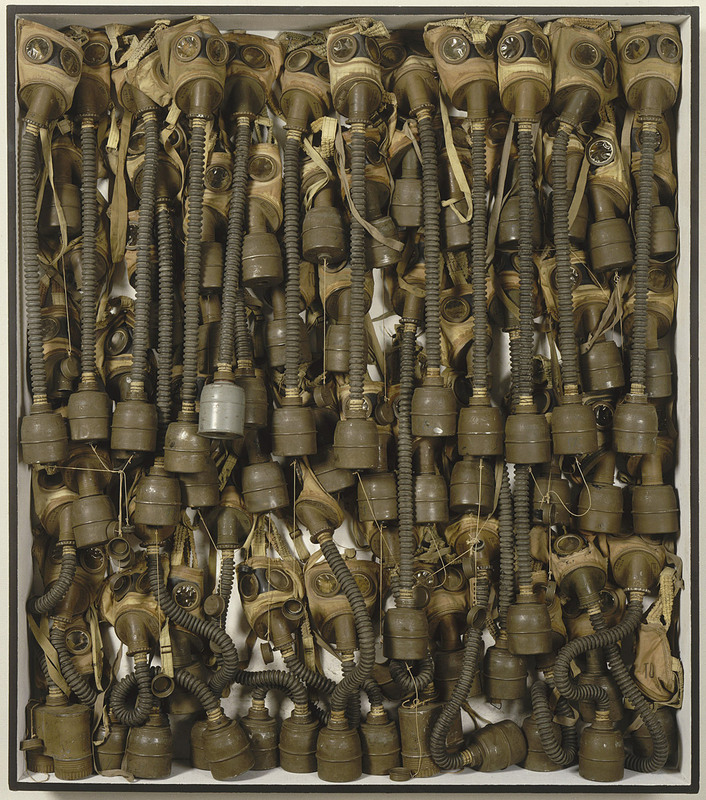 whose selected work is the fabulous Home Sweet Home II (1960), a cabinet stuffed with WWI gas masks. His alcove was sparingly decorated with a selection from his collection of wonderful African (and a few ancient Greek) masks and helmets. Like a little bit of the British Museum landed in an artist’s studio. This was by far the most ‘tasteful’ room, by which I probably mean the one which looked most like a typical exhibition or gallery space with the objects hung sparingly in their own space, the other rooms being much more cluttered. 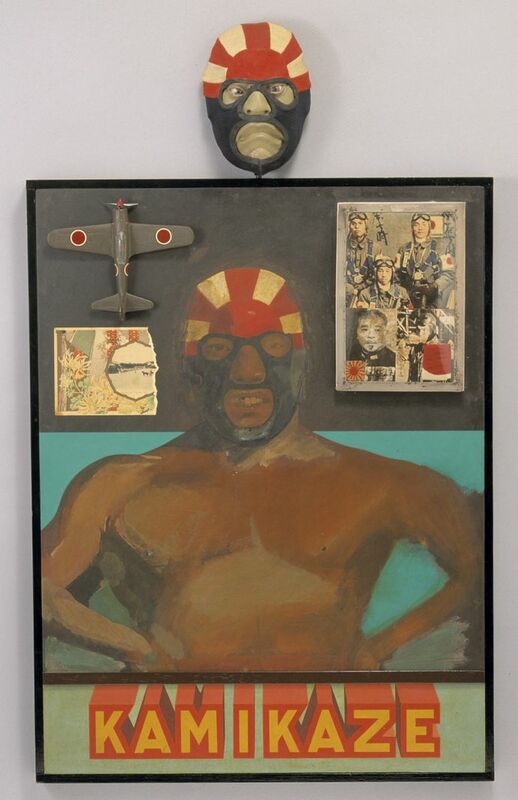 his selected work is Kamikaze (1965) normally resides in Cardiff’s National Museum of Wales (I actually went looking for it specifically two weeks ago and it had vanished… it was here!). Blake will be forever associated with the cover of the Beatles Sergeant Pepper album which typifies a kind of 60s amused, nostalgic fondness for the relics of English life, and that’s very much the feel of his collection, exemplified by – among a lot else – nostalgic metal shop signs, a large collection of elephant figurines, a large collection of Punch and Judy puppets, a ventriloquist dummy, a wall full of masks from many many cultures and traditions. Cabinet of Curiosities (from Walter Potter Museum), contains taxidermy oddities including: Mermaid, Pigosaurus, six-legged lamb, Jack-a-lope. 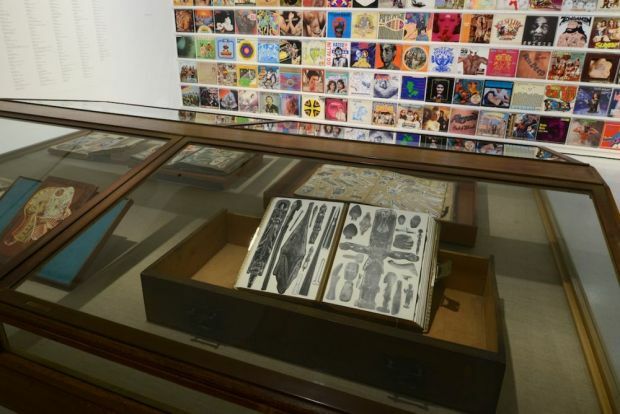 Blake’s cabinet collection full of elephants is displayed in deference to Howard Hodgkin’s Mughal Indian paintings. selected work In the studio of Jamini Roy (1976-9). 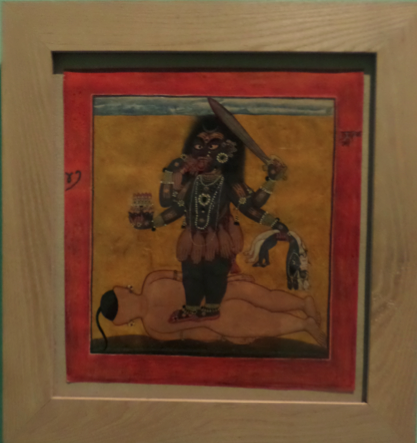 Hodgkin acquired an interest in India and Indian art when he was at school at Eton and his is a small room hung with ten or so, presumably valuable and choice, examples of classical Indian art which left me cold, apart from the depiction of Death cult Goddess KALI whose image I went searching for in the Berlin museum of Ethnographie as part of research into Creative Destrustion/Destructive Creation. I liked the Persian carpet, though. 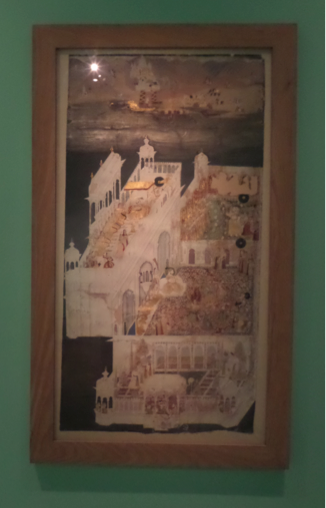 The Indian art prints span Mughal, Rajasthani and Deccani eras. his selected works are from the collection of a private man (2011), several shelves of small round or tubular white ceramics, little ivory carvings, pottery, shells and fossils. De Waal is a London-based potter and writer who won a wider audience with his book The Hare with Amber Eyes (2010) and who is represented here by stones and fossils and some of the 264 netsuke(small hand-carved objects used in traditional Japanese dress as toggles for kimono robes) which he inherited from his great-uncle Ignace Leon von Ephrussi. “A hare with the amber eyes” is prominently displayed but I was surprised by a tiny ceramic of ‘Ama suckling an octopus’, which reminded me of some of the images in the British Museum’s Shunga exhibition. British photographer who specialises in the tackiness of modern life. His works were five photos of iconic tourist destinations looking uncomfortably packed and thronged – titled Notre Dame 2012, Venice 2005 (pigment prints) and Macchu Piccu 2008. Since the 1970s Parr has been collecting thousands of tourist postcards, with which his exhibition room is covered – b&w or early technicolour images of late 1950s/early 1960s cars, tower blocks, holiday resorts, Trust House Forte motorway service stations, the Totton bypass (!? ), airplane travel, 1960s cars, chimney demolitions, car wrecks, bonfire construction, dead mammals, battleships, suffragettes and strike scenes, shoes/clogs. – funny, evocative, nostalgic, a vanished world. This major collection of postcards commemorates spans of the 20th C. and includes memorabilia from Butlins where he once worked. 25 postcards and sets of 6 images per frame. 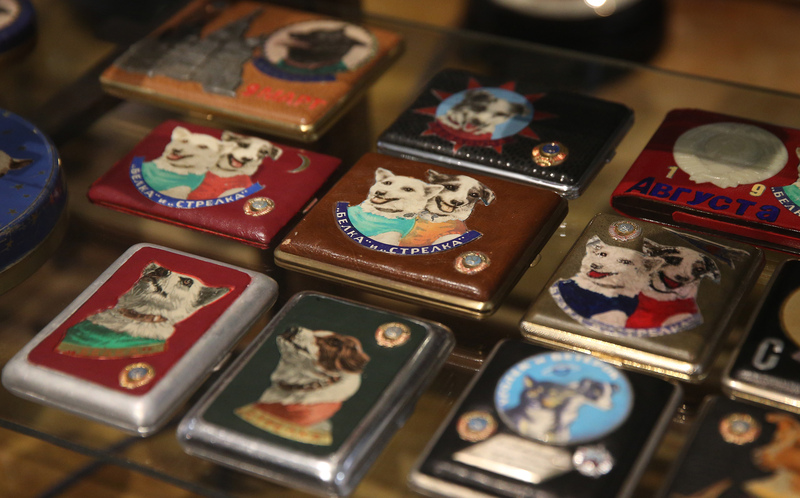 Not to mention his collection of memorabilia commemorating Soviet space dogs, represented here by no fewer than 43 space dog mementoes. Fish screen print wallpaper, 1983. screenprint acrylic on linen; Airplane, Robot, Space ship, Monkey, Apple, Frog, Clown, Police car. 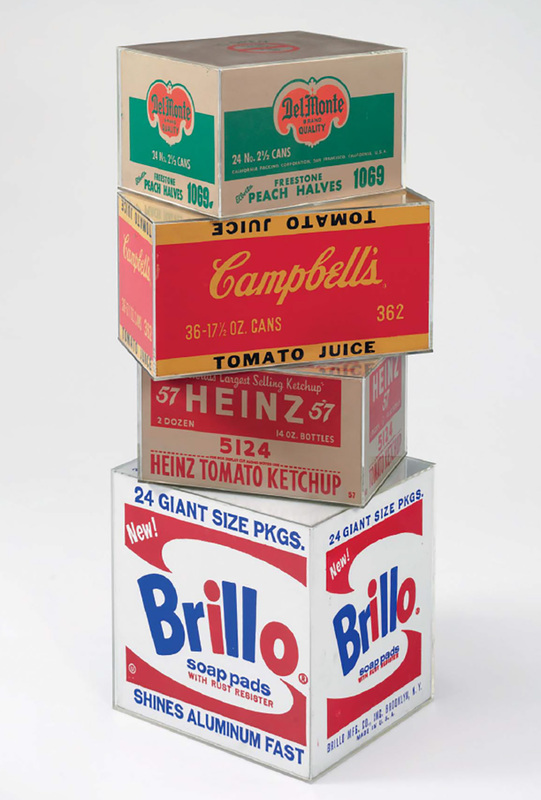 (1928-87) his selected works are some fish-themed wallpaper (1983) and the famous silkscreened boxes paint on plywood (1964) Brillo, Heinz, Campbell’s. Warhol bought and hoarded compulsively: when his collection was auctioned off after his death it turned out to contain over 10,000 objects and took ten days to flog: a vast treasure trove of every conceivable kind of junk, kitsch, novelties, consumer objects. Warhol was exited by his acquisition and possession of things rather than their use or appreciation and often left them in a closet still in their wrapping. 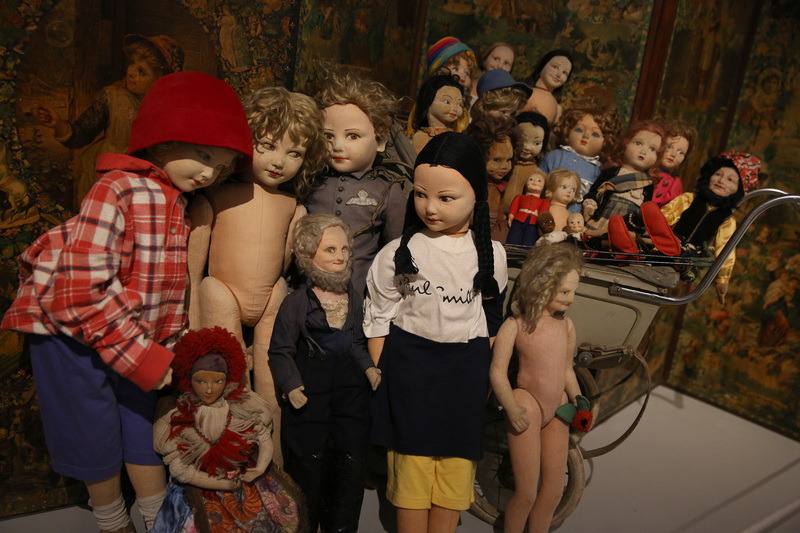 His collecting was said to be a compensating for an early life of devoid of possessions, many of his collections centred on childhood artefacts. 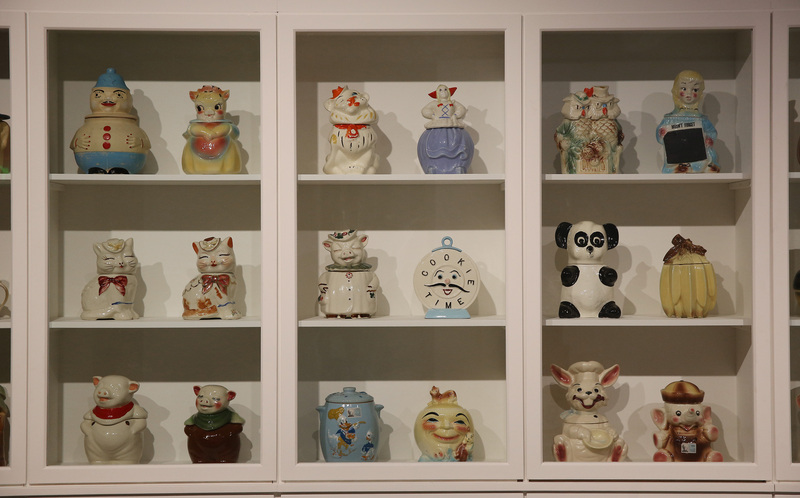 In one cabinet stood a selection of the ‘famous’ collection of 175 kitsch ceramic cookie jars he was known for. b.1963) Los Angeles-based, Pae has large collections of ‘the kitsch, the decorative, the everyday’, including no fewer than ‘3,000 textiles by prolific American designer Vera Neumann (1907–93)’. Cloud Clusters, 2005 is a suspended installation of powder coated wire cubes. A selection of these fabrics, are hanging from the ceiling in her alcove in her installation and it is mildly dreamy to walk among them letting the delicate multi-coloured forms brush against your face’. Kitsch decorated flags, tea towels are displayed like Buddhist prayer flags, various textiles with multitudes of designs and sizes from curtains and bed spreads to handkerchiefs. Collection reflecting shared appreciation of east Asian art and culture, American and kitsch. Chosen artwork displayed, Vodka & Tonic, 2012. applied gold leaf to cardboard box. Things I noticed; A collection of Donald Ducks strangely resembled the collection of Buddha statues. 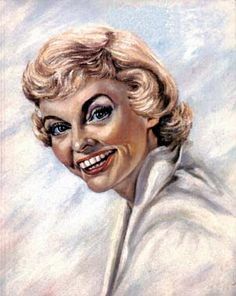 The collection of African ethnic art was starkly juxtaposed next to the American portrayal of black people as gollywogs, “sambo” and “house niggers” on 1950s & 60s consumer paraphernalia. In this exhibition ‘All the unknown painters that painted the thrift store paintings are the actual painters of the paintings’ – Jim Shaw. 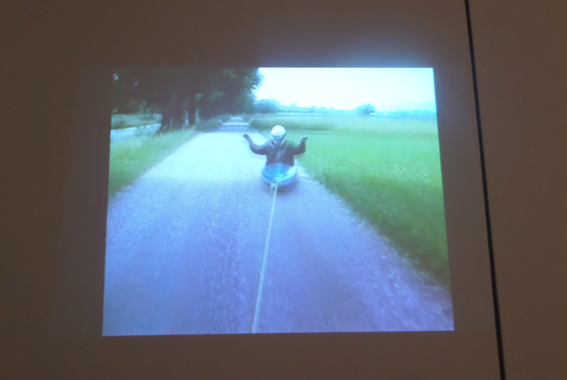 Artist Roman Signer, Slow Movement, 2015.